Facebook owned WhatsApp has became the most power full and popular messaging app. The company also updating its app to provide more and more features to its users. WhatsApp has rolled out one more security feature on Friday named two-step verification for all users. This new security feature provides more secured activation of the app on new device. 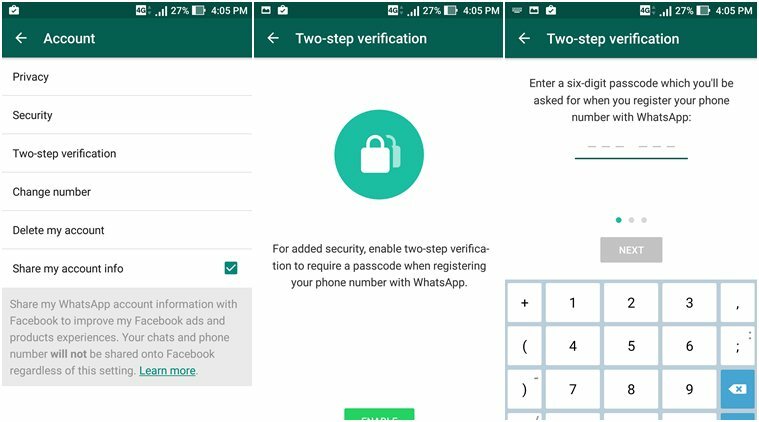 WhatsApp states " For added security, enable two-step verification to require a passcode when registering your phone number with WhatsApp." The company was working on this feature for months and in November WhatsApp rolled out it for beta testers. Existing users of WhatsApp can also enable two-step verification feature. To enable it go to Settings > Account > Two-step verification > Enable. By enabling this feature, it will ask you to enter six digit passcode which will be asked for when register your phone number with WhatsApp. To add more security, you may also enter your email address. WhatsApp will send one link to your email to disable two-step verification in case you forget your six digit passcode. Once you confirm and you are done. User can change passcode anytime and also can disable it anytime. With enabling this security feature, no one can activate your phone number on WhatsApp. Two-step verification is an optional security feature which can provide more security to your account. If someone tries to verify your phone number on WhatsApp than it will ask for your six digit passcode that you created. In case you forget your passcode and you did not provided any email to disable two step verification then your number will be permitted to reverify on WhatsApp after 7 days but your all pending messages will lose on reverifying.